The Ministry of Education (MoE), with support of its development partners, on Monday, began a 5-day education sector review training in Ganta, Nimba County. The exercise is being funded by the World Bank and the United States Agency for International Development (USAID). It is being attended by District and County Education Officers from the 15 political sub-divisions of Liberia, officials of the Ministry of Education, Civil Society, and other education stakeholders. The objective of the forum is to set the stage for the joint education sector review for 2018 with focus on County education perspectives, solicit recommendations and solidify actions to strengthen county education systems. Speaking at the opening of the training, the Acting Minister of Education, Mr. Latim D-Thong said the joint education sector review provides the Ministry the opportunity to, among others, review the entire education system of the country, x-ray past progress report and to determine challenges they have at-head. He said those challenges in the nation’s education sector can be addressed if all stakeholders work together in formulating news plans, policies and programs aimed at addressing them. According to Minister Latim Da-Thong, the MoE’s goal is to provide quality education for all Liberians. He calls on participants and donor partners to work together in-order to ensure the success of President George Weah’s pro-poor agenda which also focuses on providing quality education to all Liberians. 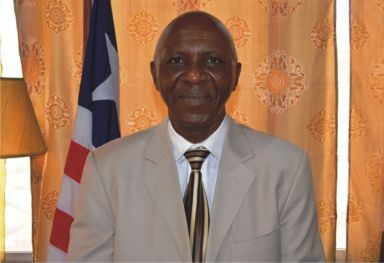 The Liberia educator described the event as historic. He explained at the end of the weeklong deliberations, participants will be able to find the best ways forward with respect to improving the nation’s education system. Speaking on behalf of civil society organizations (CSOs) Mr. Anderson Miamen, an executive of Center for Transparency and Accountability in Liberia (CENTAL)] pledged CSOs support to the education reform initiatives of the MoE. For their parts, the Director of Education for USAID, Mr. Malcom Phelps; and World Bank Education Specialist, Oni R.Lusk-Stover, separately pledged their institutions’ support towards the education sector of Liberia. At the close of the conference, participants are expected to adopt a Joint Education Sector Review (JESR) declaration.